There was a big earthquake of magnitude 7 all over Republic of Haiti in January 12, 2010, one-third people suffered from its damage, victims reached to over 310 thousand ,and most of buildings & houses were completely destroyed.Over 300 thousand sufferer still forced to live in camp without water and toilet at disaster area. It’s one of the poor country Republic of Haiti even before the earthquake such as half people live under US$1.00 a day, GNI is only about 50 thousand (3,400 thousand its of Japan),54 amount 1,000 new born baby die within a year, the average life expectancy is 61 years old, only 19% can use toilet , serious food shortage depend on food aid from foreign countries, so on. 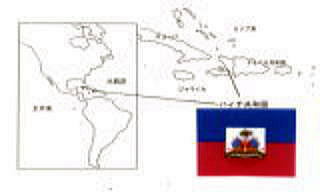 It’s been 27 years since Association Haiti established in 1986 for helping Haitian’s independence from poverty. We started educational assistance to Christian Church children, and expand our activities to agriculture aid to young people from 2001. We made 7 ha. General farm at Bonabit village , Hinche city in 2004 for subsistence farming of their own food ,also established elementary school of 300 children in 2007 as the first educational facility in the farm area. We save their lives by way of serving school lunch besides learning at school. They organized KFP (Community Family Peasants) that a majority of residents join and help each other at the general farm.They use its elementary school as their assembly hall. We continue our activities “Save present lives by agriculture, and create future Haiti by education”,considering Haitian living to help them not out of pity but out of feeling as our friends living in a same world ! Copyright © ハイチの会, All rights reserved.